It's President's Day so I thought it was the perfect time to do some penny experimenting (Abraham Lincoln is on the penny, after all!). 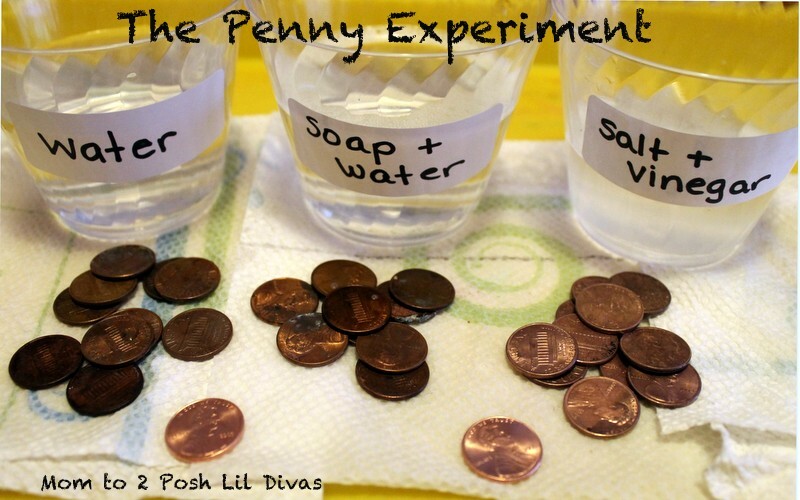 The Lil Divas LOVE our experiments, so they were instantly intrigued by the idea of performing some experiments with our pennies. This is another fun & easy experiment/observation to do with the kids at home or school. I then asked them to tell me how we could clean the dirty pennies. The Littlest Diva suggested we wash them in water. Building on that the Oldest Diva suggested we use soap & water. I suggested we do both, plus use a special mix that I had in mind and see what happens. They were up for the challenge. I took this opportunity to introduce my "special" cleaning mix. so that half the penny was in the mixture & half was not. & let the Lil Divas observe what had occurred. took out 10 of the pennies from the salt & vinegar cup and placed them on a napkin (without rinsing or drying them). After an additional 5 minutes (10 minutes total for the experiment), we came back to see our results. The water only cup had no noticeable results. 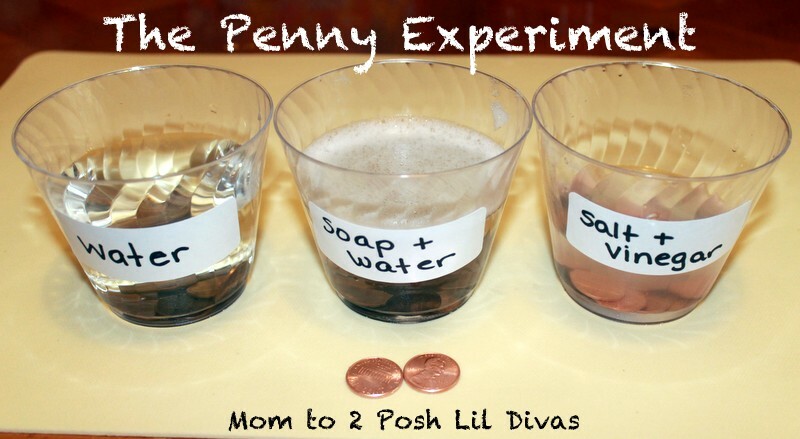 The Lil Divas thought the pennies in the soap & water cup looked a little cleaner. 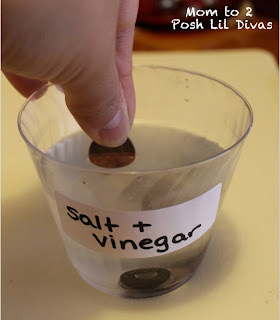 The pennies from the salt & vinegar mixture were noticeable cleaner. I rinsed the pennies that came out of the salt & vinegar cup in plain water. Pretty cool! It's like what happens to the Statue of Liberty. Why do they turn this bluish-green color? The cooper in the penny reacts with the air (oxygen) and salt and turns the penny green. Thanks! 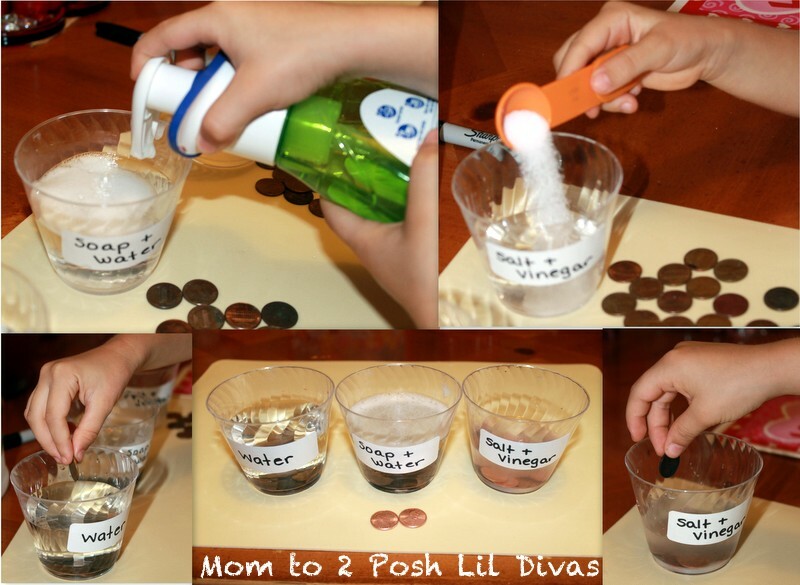 So easy to do & the Lil Divas were completely captivated by the results. Saw your project on Pinterest today, which was perfect because my 5yo son has been asking to "do some science" - so we did it this afternoon & videoed it... I'll edit it & put it up on Youtube, with a link back to you, of course! Great science idea again. I love these kind of posts. thanks. fun experiment. we love finding new ideas. Thanks for sharing. what a fun experiment! thanks for sharing on craft schooling Sunday! I just found your site and I am LOVING it! My five year old daughter is always wanting to do experiments and I was running out of things to do that didn't require spending $$$. Thank you for all these! so fun! we did this experiment this week too! I always love the variations I see on the penny experiment. Everyone has their own acidic thing they use to clean the pennies. The most amusing to me has been ketchup. What a fun experiment! Thank you for sharing at Sharing Saturday!! I hope you will share with us again this week! We did this at our homeschool and we let them sit for 3 weeks, taking notes every other day. It amazed me what happened in the end!! We ended up with a penny with a hole in it!!! I use this experiment for discussing "working together" to get something done for my preschoolers. Vinegar doesn't get the pennies clean by itself, salt doesn't get them clean - but when you put them together....clean pennies! Ok I have a silly nerdy question. Pennies 1982 and older are solid copper, pennies younger are mix medals. (Older pennies are actually worth 2 cents, double) Did you notice a difference in the pennies according to age? ketchup also works well to make a penny shine! Hi! Quick question! 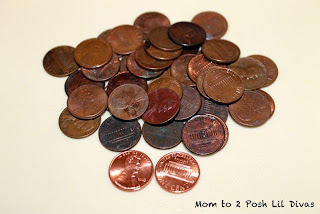 How long did it take for your pennies to turn green?! I would love to do this with my class but we do not have very much time (a week)!